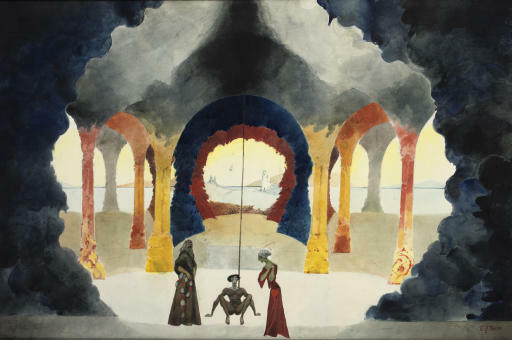 Edward Burra was commissioned to design the stage set for the ballet Don Juan in 1948. The ballet was performed at the Royal Opera House in Covent Garden on 25 November 1948, to music composed by Richard Strauss. The music was based on the legend of Don Juan, written by the Austrian poet Nicholas Lenau (1802-1850). The ballet was choreographed by Frederick Ashton. He directed his cast to portray the story as a psychological drama in which Don Juan genuinely loves the women he seduces, not as a cruel and lustful womaniser. Edward Burra's set for Don Juan uses fantastical settings and colours, and classical architecture.